Integratly migrate data from HDD and computer to another one. 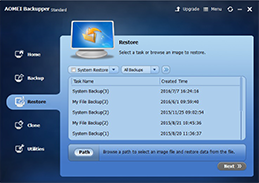 AOMEI Backupper is a best and free data loss prevention software, and it offers backup, restore and clone function to backup and restore data on disk, partition and system. If you still worry about that data will be lost or hacked, you can encrypt backup image. Indian businesses lost over $1 million from data loss and downtime in the last 12 months, a survey by EMC Corporation, the world’s largest data storage multinational.Data is very vulnerable in front of virus, hacking, accident etc. Most commercial organization and individual take so much funds on data disaster rescue after data leaking or losing. If you don’t want to waste your more energy and money on recovering lost data, you can use take data protection solution. AOMEI Backupper is able to protect individuals’ data freely. There are multiple ways to backup your data and prevent data from loss: System Backup, Disk Backup, Partition Backup, and File Backup. There are other backup catagorise to assist you to backup data easily. Schedule backup: Backup data automatiucally on the fix time or intervals, and event trigger can run backup task when you shut down computer. Incremental/differential backup: After doing a full backup, you can back up part that is incremental or differential based on previous full backup image. 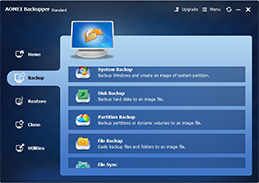 What to be restored: Restore system, disk, partition and files that you backed up before. When to be retored: Support to restore any time point of backup image if it isn’t deleted. Where to be restored: image can be restored to HDD, SSD, network, NAS or other computer. Disk Clone: Transfer all data on disk including invisible files to other HDD or SSD. 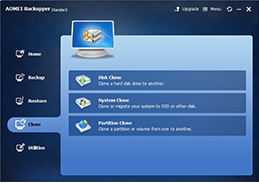 Partition Clone: move all files and folders from one partition to another one without any data missing. Check Image: check whether your backup image is integrated or not. Create Bootable Media: create a bootable USB, or CD/DVD to backup and restore system in Win PE. View log: Every task of backup, restore, and clone can be recorded, and you can see its log. Compression: You can set compression level for a backup. 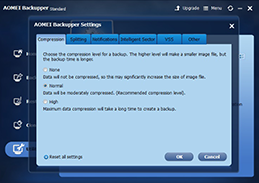 The higher compression level is, the longer backup time will be taken. Spliting: splitting a larger backup image into multiple smaller backup image. You can store a whole backup image into different USB or CD. Notification: provide Hotmail server, Gmail server, AOMEI server [paid] and custom server [paid] SMTP modes. Intelligent sector: set different backup way: intelligence sector and sector by sector. VSS: Allows to back up data without interrupting operation in progress. Other: allows you to decide whether to check backup is complete or not, and select the software display language. 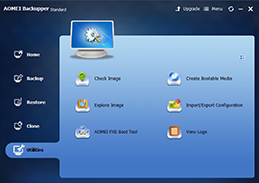 AOMEI Backupper Standard is a free data loss prevention software that offers basic functions of backup, restore and clone. If you want to enjoy more advanced functions, or protect multiple computers in one company, please buy advanced edition. How to Clone Only OS Partition to SSD in Windows 7? How can I set to make software backup data automatically? You can set schedule backup while backing up or set it in advanced option of every task. For more the specific operation, you can visit Schedule Backup? I need to backup multiple computers off works, how to do it easier? You can use AOMEI Backupper newest version to backup data, beisdes, you can set event trigger in schedule backup task. It will help you backup data in every computer, and then shut down computer automatically. For more the specific operation, you can visit Event Trigger? How to make everyone within one company to share file or backup image? You can backup or sync data to server or NAS, and everyone within one company. There are another way: In every client, you can set NAS or server as mapped drive, and everyone can backup or sync to mapped drive. These wyas can make files or backup image to be shared.